This is another installment in our series of interviews of MSNS members. This edition will feature paper money dealer-collector Larry Falater. Larry was born in Detroit in 1935. He even remembers the date he began collecting--December 10, 1941, his sixth birthday. His father gave him the Indian head cents that he found in his milk delivery route, when he was an Ira Wilson Dairy delivery man. Back in those days, the Lincoln cent was only a little over 30 years old. People didn’t even collect them much. Everyone got the penny board for the Indian head cents. Eventually he completed that board, as well as the board for the Lincoln cents. He went back to collect large cents as a teenager, and had every variety from 1839. Larry says he was going without meals in order to have enough money to buy what he was interested in. He would go to rural shows downtown in Detroit. When he was a child, children didn’t collect paper money, especially U.S., because it was too expensive. As a youth, he would go downtown to J. L. Hudson’s to look at coins, like a wide-eyed kid in a candy store. Eventually he worked for Earl Schill, a coin dealer, full time and later becoming part time. Eventually, he became interested in paper money, which is what people recognize him for today. He was interested primarily in Michigan notes, especially the obsolete bank notes. The first note that he collected was from the Macomb County Bank. Back in the 1950s, he assembled a complete set of Confederate notes, which today would be worth quite a bit of money. As economics allowed, he got into Michigan National Bank notes. as time went by, he was purchasing quite a bit. Sometimes he had to buy entire collections to get what he needed. Larry put himself through college, and he and his wife had four children. Economics restricted his collecting activities. In earlier years, he always had a list of potential purchases. What was agonizing was that he couldn’t buy many of them. The problem was that some of these notes might never come up for sale again for a very long time. As funds would allow, he would acquire some of them. About 10 years ago, he had the most representative collection of Michigan National banknotes from different towns. Subsequently, he sold that. Larry still has all his Michigan obsolete currencies. He collects the whole spectrum of depression scrip, and also Michigan stock certificates. He has one from every company, which includes all the automotives. He has even gotten into collecting bank postcards. According to Larry, since he retired from Chrysler he has been working as a dealer full time. During the interview, Larry mentioned that he does not have his national currency bank notes collection anymore, although he still has some notes. He also mentioned that when the Mercury dimes were in circulation, he assembled the whole set out of his pocket change, except for the 1916-D. He bought a “close to good” one for $4.00! These days, he is collecting material from Detroit and Hillsdale. He is a life member of ANA, as well as MSNS, Paper Money Collectors of Michigan, Central States, TAMS, and others. Larry Falater is also an author of a book and price guide. 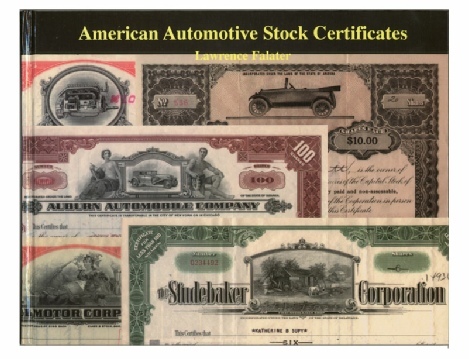 He wrote American Automobile Stock Certificates, which is a fully illustrated collectors’ guide of automotive stocks and bonds. He also writes articles for various coin publications. Larry’s advice to young collectors is, “Buy the best and rarest you can.” That’s always difficult to do without the knowledge, and you don’t want to put out a lot of money unless you know you’re getting good value.